Dwarka, a city that was known as Dwarawati in Sanskrit literature is one of the seven most ancient cities of India. 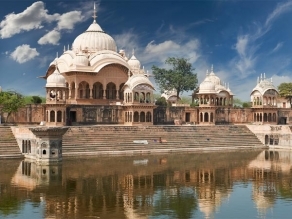 This city was the abode of Lord Sri Krishna. It is the only place considered both as one of the “char dham” (four principal holy places), as well as one of the “sapta puris” (seven holy cities) in our religious texts. Lord Krishna killed the oppressive King Kansa, ruler of Mathura and his maternal uncle which caused a long lasting rivalry between the Yadavs and Kansa's father-in-law Jarasandh. To avenge Kansa's death Jarasandh attacked the Yadavs for seventeen times and in order to avert further clashes Lord Krishna led his community of Yadavs across the Girnar mountain to the state of Saurasthra or Gujarat. For leaving the battle Lord Krishna affectionately came to be known as Ranchhodrai (one who leaves the battle field). He left Mathura and shifted to Dwarka to lay the foundation of his kingdom in Beyt Dwarka, a place close to port Okha. Here, he spent a significant part of his life. After Krishna's death a massive flood swallowed up the city. It is believed that Dwarka had submerged six times. Today's Dwarka is therefore the seventh city to be built in this area. The name Dwarka is derived from the word 'Dvar' that means Door in Sanskrit and the significance of this word is the door to Brahma. The city has special significance for the Vaishnavas. The Jagatmandir temple here has the idol of Dwarkadhish, a form of Lord Krishna. Nageshvara Jyotirlinga, one of the 12 Jyotirlingas of Shiva, is also located near Dwaraka. Beyt Dwarka is the place where it is believed that Lord Krishna had established his kingdom. This Island, situated in the Gulf of Kutch, is a small island and was the main port in this region before Okha developed it as a port. In order to get here from Dwarka, one needs to go to Okha port jetty and then take a ferry to this place. History dating back to the 3rd century BC can be traced on this island. Beyt Dwarka is also linked with a legend where Lord Vishnu killed the demon Shankhasura and so this island is also known as Beyt Shankhodhara. 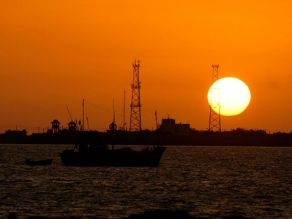 In Beyt Dwarka one can see dolphins, go for picnics or camping and even for marine excursions. 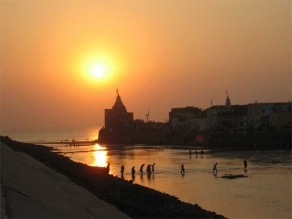 The city of Dwarka is located in the Jamnagar District of Gujarat. Dwarka lies in the westernmost tip of the Gujarat peninsula. There are numerous holy shrines in and around Dwarka and Beyt Dwarka attracts tourists every year. The Dwarakadhish Temple, Nageshvara Jyotirlinga Temple, Shrine of Meerabai, Shri Krishna Temple, the Hanuman Temple and Kachoriyu in Beyt Dwarka are some of the important religious places of Dwarka. With all the religious backgrounds, Dwarka has always remained and continues to remain one of the most visited places of Gujarat. The weather in Dwaraka remains beautiful almost throughout the year. Travellers planning a trip to Dwarka can reach the destination via air, rail and road. Located on the state highway from Jamnagar to Dwarka, the city of Dwarka can be easily reached by buses from Jamnagar and Ahmedabad. While the Gujarat State Road Transport buses connect the holy town to all major cities in the state, one can also opt for the luxury tourists buses that ply to the town from almost all the nearby cities. The Dwarka station is located on the Ahmedabad-Okha broad gauge railway line where there are trains connecting the city to Rajkot, Ahmedabad and Jamnagar. Also, there are some trains that continue upto Surat, Vadodara, Goa, Karnataka, Mumbai as well as Kerala. The nearest domestic airport to Dwarka is the one located at a distance of 127 km in Jamnagar from where one can pick up a taxi to reach the Dwarka city. There are regular flights traveling from the Mumbai International Airport to Jamnagar.